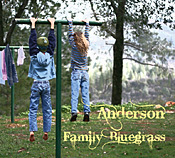 The Anderson Family, from Grass Valley, California, performed as a popular crowd-pleasing northern California bluegrass band continuously from early 2005 through 2013. Mark and Christy Anderson and their four kids, Paige, Aimee, Ethan (Bo) and Daisy, made new friends and fans every day with their unbeatable combination of outstanding lead and harmony singing, impressive instrumental abilities, savvy stagecraft and boundless energy and charisma. 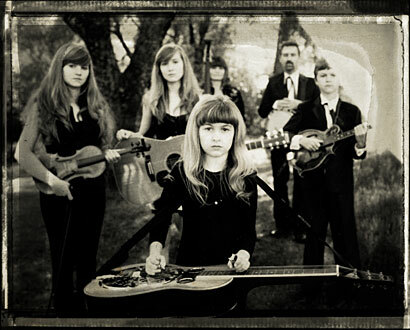 From events like the annual CBA Father's Day Bluegrass Festival in California to San Francisco's Hardly Strictly Bluegrass Festival in Golden Gate Park to the International Bluegrass Music Association convention in Nashville, the Anderson Family won over audiences nationwide with a traditional bluegrass sound and a fresh, modern approach. June, 2011: Our new 2011 Live from Grass Valley CD is now available to order online at CDBaby.com. Go grab yourself a copy or see us at any of our performances to get yours. March, 2011: Paige is a featured contributor to the March/April Flatpicking Guitar Magazine's Fiddle Tunes issue with her rendition of Leather Britches. The feature consists of tab for the song and an audio file for those who have the audio subscription option. Click the image here to go to the FGM web site's backorder page to get your own copy. It's available digitally or hard-copy on their main web site. February, 2011: Back in Nov. 2009 we had sold out of our stock of Paige's vinyl record with Chuck Ragan in the first week. We're pleased to announce that we now have a limited quantity of the last of that pressing, ready to ship. Go to our Music page and scroll down toward the bottom to pick up a copy. August, 2010 -- Hardly Strictly Bluegrass Festival: We're honored to have been asked, and are excited to announce that we'll be playing at the 10th annual Hardly Strictly Bluegrass Festival in San Francisco at Golden Gate Park in October with about 90+ other excellent bands. This will be a blast. We're scheduled to play Sunday Oct. 3rd at 6:25pm on the Porch Stage. This festival runs from Friday Oct. 1 through Sunday Oct. 3 and is FREE. November, 2009: We just got done playing some California dates with Chuck Ragan on his Revival Tour 2009. What a blast that was. It was a great group of musicians and a good mix of music styles. Here's a link to the Twang Nation Review of the tour. And check out the photo gallery for more than 80 cool photos by music photographer Scott G. Toepfer. You can find a couple YouTube clips from the tour HERE. Since Mark was shooting the video, these two only feature the kids on a couple of Chuck's songs. September, 2009: For those of you who subscribe to Flatpicking Guitar Magazine, keep an eye out for your September/October 2009 issue. Paige is featured in an article on her flat-picked rendition of Tommy Emmanuel's Lewis and Clark. Paige had opportunity to sit and pick a couple with Tommy at this summer's World Music Festival in Grass Valley, California. See our photo gallery for a couple of photos of Paige with Tommy there. August, 2009: Check out the updated Music page. You'll find several new audio samples and now a few video clips as well. January 31st, 2009: We've added a new email-mailing list feature to the web site. Click on the Mailing List menu button and add yourself to the list for occasional email updates. June 13th, 2008: Our new CD is hot off the press and available for online purchase HERE at CDBaby.com! And of course we'll also have it available for sale at all of our performances too. There are several short preview samples posted now to our Music page. February, 2008: Bluegrass Now magazine -- Paige is featured in the opening Editor's Letter and in the Teen Scene column with an interview by Stephanie Dilling. 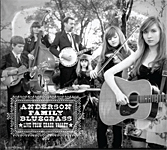 January 12, 2007: The Anderson Family Bluegrass Band is featured on NPR's California Report Weekly Magazine Radio Show. Reporter Anna Sussman spent a day with the Andersons at their Grass Valley home back in August. The piece includes discussion with the family and of course some bluegrass music. The audio segment is archived on NPR's web site HERE. September 2006: Paige is featured in the September/October 2006 issue of Flatpicking Guitar Magazine. This issue features several women guitar players from around the country. Paige's part includes an interview, and for those who subscribe to the magazine with the CD option, a performance of one of her current favorite guitar solos, "Farewell Blues". Copies of the issue (including the CD version) are available for order through the Flatpicking Guitar Magazine web site (click on their Back Issues link).